Home / Lakewood Ranch Plumber / A Plumber With Experience! When people in Sarasota call a plumber, it is usually because they have a plumbing problem and don’t know how to fix it. They want to rely on a professional plumber to do the job right. They want a plumber with experience! Customers don’t call and say, send me a helper to fix my plumbing, they want a plumber with experience! After all, if your going to pay for a plumber, have them send you a man who at least holds a journey man’s plumbing license. This license means they know the theory of plumbing, how waste and vent lines work together to protect the health of the nation. 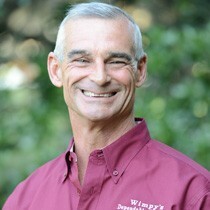 Wimpy’s Dependable Plumbing employs Florida State Certified Master Plumbers. That’s what you will get when you call us to solve your plumbing problem. We don’t send helpers to do a plumber’s job. We send a plumber with experience! I started plumbing with my dad, Wimpy, at the age of 7 years old. Going to work with him on Saturdays and in the summer, I enjoyed plumbing from an early age. This was a time well before OSHA rules and child labor laws. I vividly remember the age of seven, because one hot summer day I was carrying a ladle full of hot lead to my dad on a rough-in for a commercial building. The ground at this stage of construction isn’t level. I stumbled and poured the hot lead into my tennis shoe. It was scalding hot as you can imagine the temperature of the molten lead. I got to sit under a nice oak tree the rest of the day! Even today, I want to learn more. There are new things to learn every day. I feel I am wasting my time here on earth if I don’t learn at least one new thing, every day. Experience only comes from doing your time. Wimpy’s Dependable Plumbing has stood the test of time for forty years. We are the Plumbers with experience! Call Wimpy’s Dependable Plumbing for your next plumbing problem. We have the experienced Master Plumbers to solve your plumbing problems. We want you to Love Your Plumber! Visit us at www.loveyourplumber.com or call 941-322-1911.